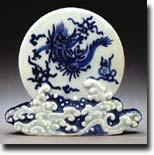 The majority of pieces in the Los Angeles-based Kurtzman Family Collection feature pure white porcelain adorned with fine painting in underglaze blue. 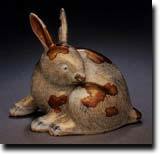 Some pieces are embellished with brown glaze; others, more rarely, are covered with a fine celadon glaze. 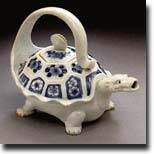 Almost all of the porcelains on view were produced in the 19th century, when Hirado ware was renowned-especially in the Victorian West-as desirable export ware. The works in the exhibition, which traveled to SAAM from the Los Angeles County Museum of Art, were produced in the Hirado fief, located in Kyushu, Japan. Hirado refers both to the name of the fiefdom and to the island off Kyushu that was part of the ruler's territory. Close to the Korean peninsula, Hirado was a natural locus for international shipping and trade between Japan, Korea and China. 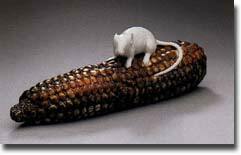 A Korean potter - who married into a Japanese family and took the Japanese name Sannojô - found kaolin, the basic ingredient in porcelain clay, at the village of Mikawachi in the mid-1600s. Sannojô's kilns, established under command of the Hirado daimyo (feudal lord), began producing Hirado Mikawachi wares. While Japanese scholars often technically refer to this material as Mikawachi ware, the popular term in both Japan and the West is Hirado ware. 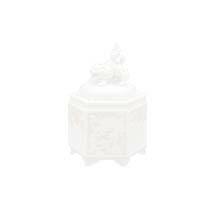 Hirado porcelain was produced initially for the daimyo's exclusive use, then later for commercial distribution. 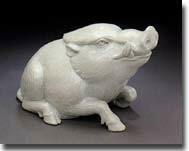 Early Hirado ware was known in Japan for its high quality and fine craftsmanship. 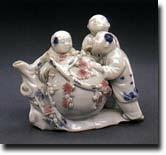 The golden age of Hirado porcelain lasted from 1751-1843, during which time the finest porcelain in Japan was produced. When the economic structure of the feudal system began to disintegrate during the early 19th century, daimyo support of the kilns was replaced by export contracts with the Dutch East India Company. 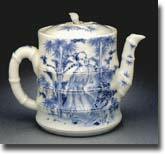 By the 1840s Hirado ware had become an export eagerly sought by sophisticated buyers in the West. 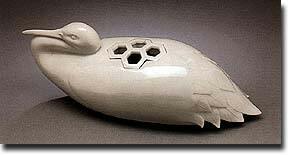 Hirado porcelain was featured in the great international expositions of the late 19th and early 20th centuries. With the advent of modernism in the early 20th century, however, demand for Hirado fell. Allan and Maxine Kurtzman of Los Angeles were attracted to Hirado ware upon inheriting a Hirado jar from Allan Kurtzman's grandmother. Within a brief span of 10 years starting in 1988, they collected some 240 pieces. Their collection is now documented in a 56-page, soft-cover, full-color catalog, which accompanies the exhibition. The exhibition was organized by the Los Angeles County Museum of Art, where it was on view from November 1997 through June 1998. Endowment Support provided by the Dean and Mary Thornton Exhibition Endowment.